Hours of lost radio programmes have been recovered following an appeal by the BBC in 2001, including some that have not been aired since the 1950s. The treasure trove includes a rare recording of the Beatles, Gregory Peck playing the piano and three lost Hancock episodes. Excerpts from selected lost gems will be heard for the first time in decades on Saturday when a new series of Radio's Lost Property begins on BBC Radio 4. 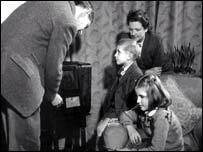 In the early years of TV and radio, shows were often erased, lost or simply not recorded. Many of the lost recordings were made by enthusiastic amateurs, such as Joanne Tansley who recorded 60 "missing" programmes. "It just occurred to me at the time that the BBC just might not be saving some of these because they had a bit of reputation at the time for getting rid of some of their stock," she told BBC One's Breakfast. Soon after the appeal by the BBC in 2001, a rare unseen copy of Dad's Army was discovered - and the material kept coming in. Highlights include recordings of the Beatles at the Royal Albert Hall in 1963, Gregory Peck playing the piano, and an entire Kenneth Williams Playhouse comedy series. Also discovered was Radio Five, a Monty-Python-like spoof by Eric Idle. And a missing Archers episode, featuring the very first appearance of Brian Aldridge in 1975, was found. BBC archivist Jonathan Dann said many recordings sent to them are too poor quality to be broadcast but some can be restored to near perfection. He said there were some rare finds including a an early docu-drama on a Zeppelin raid on London. Radio's Lost Property is on BBC Radio 4 on Saturday at 2000 GMT.